Los dos prototipos de la empresa Quant, el Quant FE y el Quantino, ambos equipados con el nuevo sistema de baterías denominado nanoFlowcell, podían ser conducidos por algunos periodistas en Zürich / Suiza, con el fin de demostrar que el concepto de este singular automóvil ya está muy avanzado. Como hemos ya dicho en otras ocasiones, estos modelos destacan por su sistema de voltaje bajo (no como otros potentes coches eléctricos que trabajan a alto voltaje) y su gran autonomía de más de 1.000 kilómetros gracias a un sistema de recarga con un líquido químico bi-ION, que se transforma en electricidad para la energía que precisan sus cuatro motores eléctricos. Ademas, las altas prestaciones, 2.8 segundos de 0-100 km/h y una velocidad tope de 280 km/h lo consiguen por sus supercapacidores, baterías especiales de poco densidad de energía, pero gran potencia. We&apos;re at the TCS proving grounds in Hinwil not far from Zurich. The soft clouds of morning mist are gradually evaporating beneath the rising autumn sun. During the night, the wind blew away the film of water left on the test track by the previous day&apos;s rain. The weather promises ideal conditions for the dynamic presentation of an automotive highlight - the QUANT FE and QUANTiNO are under starter&apos;s orders for their first test-drive event at the hands of the international media. 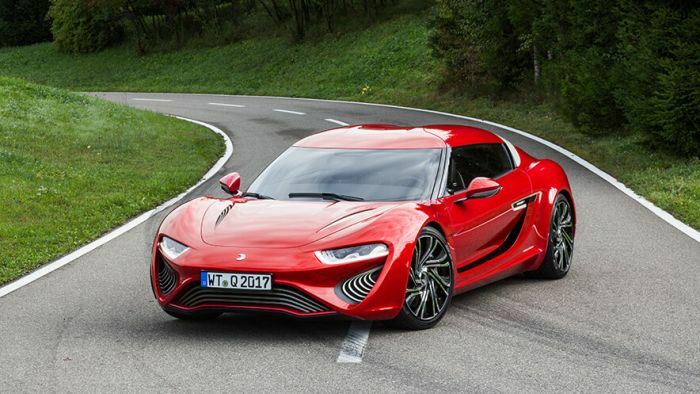 The two nanoFlowcell prototype vehicles are courting the attention of an experienced and highly critical audience: QUANTiNO, the electric vehicle for everyday use with a top speed of 200 km/h and a range of more than 1,000 kilometres and QUANT FE, the electric sports car with acceleration of 2.8 seconds from zero to 100 km/h and a (limited) top speed of more than 280 km/h. Both are different concepts for nanoFlowcell applications. The QUANTiNO is equipped with a (world first!) low-voltage drive system, while the drive system in the QUANT FE demonstrates a high-voltage application of nanoFlowcell technology. nanoFlowcell Holdings invited members of the press from all over the world to come to Switzerland to experience for themselves the power and performance of nanoFlowcell technology. On the TCS circuit in Hinwil, the QUANTiNO and QUANT FE are presenting themselves as fully-fledged electric vehicles that will deliver a major boost to electric mobility. Their nanoFlowcell drive dispenses with the restricted speeds, inadequate ranges and laborious battery-charging processes normally associated with electric vehicles. "The QUANTiNO drives like a production electric vehicle!" is how one participating journalist summed up the experience. And rightly so. Only, in contrast to conventional electric vehicles, the QUANTiNO&apos;s drive is 100% environmentally compatible and sustainable. It has no lithium-ion batteries promising zero-emissions driving while still drawing a large proportion of their energy from burning (brown) coal or from nuclear power. And it doesn&apos;t use rare or hard-to-recycle raw materials. Plus, the QUANTiNO drives three times the distance of the currently most powerful electric vehicle with lithium-ion technology. Meanwhile, the coffee machine purrs, producing creamy black espresso - energy for the test drivers. The test vehicles had been filled up that morning. Enough for the whole day - even a demanding test day like this one. Many of the invited journalists had inspected the new electric offerings from leading vehicle makers just a few days previously at the Paris Motor Show - Mondial de l&apos;Automobile 2016 - only to make the sober realisation that progress in electric mobility is sometimes relative. And likely only to be seen from nanoFlowcell technology. So is it set to end the stagnation of modern electric mobility? Expectations of the QUANTiNO and QUANT FE are running high among the journalists. They are expecting something new, something different, more of everything than perhaps anywhere else. We can tell you this much - nobody was disappointed. 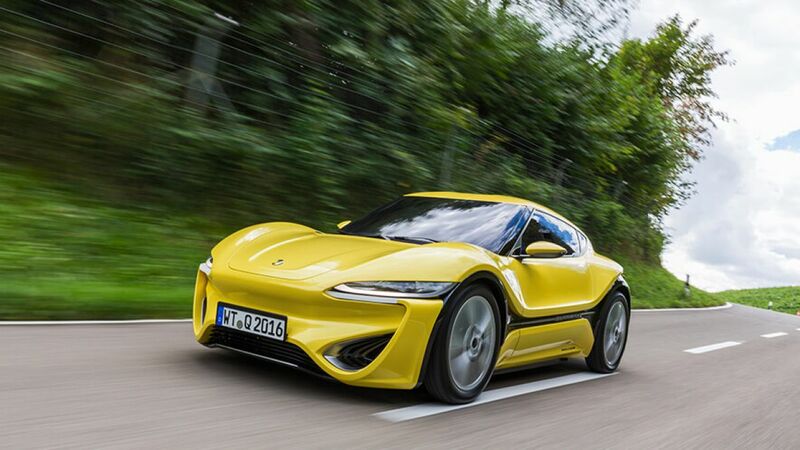 "Even without electric drive, the QUANT FE is an amazing car - all the high-tech in this vehicle, the shutlines and the premium workmanship are so untypical for prototypes. Fantastic!" said one enthusiastic journalist. And that&apos;s the problem the QUANT models have to wrestle with as ambassadors for a new kind of energy storage technology: Their avant-garde design distracts from the actual technological innovation of these vehicles - the nanoFlowcell system installed within. The phenomenal force with which the four electric motors accelerate the QUANT FE pastes a broad grin on the faces of the test drivers. Besides the fun-factor of the acceleration, one thing is clear - nanoFlowcell technology is a serious alternative as an electric drive for an environmentally friendly and sustainable future generation of vehicles. Some participants in the test drive session declared nanoFlowcell an unrivalled technology for future electric vehicles. Suddenly, the general wishful thinking surrounding a future of electric cars seems to have taken on concrete forms. Many of the questions posed by the media primarily addressed the way the nanoFlowcell works, the performance of the system and the production, distribution and use of the bi-ION electrolyte liquid. Flow cell technology in an electric vehicle is new and certainly not easy to grasp in an instant. We therefore compiled a selection of the most important questions and answers. How can the QUANT FE drive more than 800 km with a battery capacity of 70 kWh and an average consumption of 20 kWh per 100 km? A flow cell cannot be compared directly with a conventional battery, mainly because the energy converter and the energy storage medium are separate from one another. The cell itself has a continuous output of 70 kW. As long as the bi-ION electrolytes are flowing past its cell membrane, chemical energy will be converted into electricity. In the QUANT FE, the bi-ION tanks (the energy storage medium) have a volume of 250 litres each for the positive and negative electrolyte liquids. The energy density of bi-ION is currently 600 Wh, meaning the nanoFlowcell system in the QUANT FE achieves an overall output of 600 Wh * (2 x 250 litres) = 300 kWh. 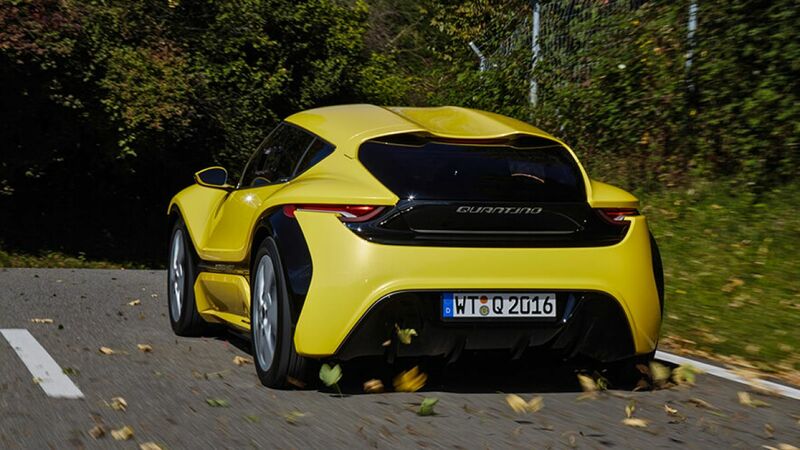 At an average consumption of 20 kWh per 100 kilometres, the QUANT FE has a theoretical range of 1,500 kilometres. In practice, however, we talk about a range of more than 800 kilometres in the understanding that the vehicle&apos;s secondary electrical consumers also draw energy. 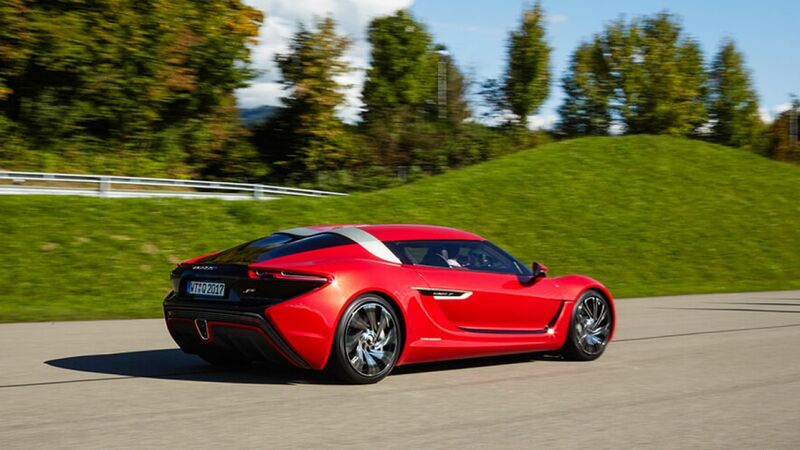 How does the QUANT FE achieve acceleration of 2.8 seconds to 100 km/h and a top speed of 280 km/h? A flow cell cannot supply this kind of power. In our QUANT FE and QUANTiNO prototype vehicles, the electric motors are not fed directly from the nanoFlowcell. Instead, the nanoFlowcell supplies electricity to a temporary storage medium - supercapacitors, also known as supercaps. Compared with normal batteries of the same weight, supercaps have only ten percent of their energy density, but their power density is up to 100 times greater. Supercaps can be charged and drained extremely quickly and thus provide a great deal of energy for phenomenal acceleration and high-speed driving. In regular driving mode, the power density of the flow cell would be sufficient to drive the QUANT FE on its own without the need supercaps. For the next development phase, our engineers have set themselves the target of supplying the motors with energy directly from the flow cell. Eliminating the need for supercaps would deliver cost and weight savings. What is bi-ION made of and how did nanoFlowcell researchers manage to develop an electrolyte solution with such comparatively high energy density? bi-ION is an aqueous solution of organic and inorganic salts, which is required to transport the actual electrolytes. These new electrolytes, developed by us, are the actual charge carriers. We achieved a breakthrough in energy density for liquid electrolytes with bi-ION because we didn&apos;t want to be able to recharge the electrolytes - as is normal in other electrolyte solutions used for redox flow cells. We concentrated our efforts fully on the design of ions suitable for carrying a high level of electric charge. The nanoFlowcell thus has ten to 12 times the energy density of regular redox flow cells (e.g. zinc-bromide battery) and four to five times the energy density of the lithium-ion batteries currently used in electric vehicles. For the time being, we are bridging the lower power density of a flow-cell based energy-storage medium in the nanoFlowcell drive system through the use of temporary storage with very high power density - so-called supercaps. What happens to the electrolyte solution after it has been used to produce electricity and how is the electrolyte solution recharged? The bi-ION electrolytes cannot be recharged. After chemical energy has been converted to electrical energy in the nanoFlowcell - the actual cell - the electrolytes are "spent". In mobile use of the nanoFlowcell, such as an electric car, we decided to filter the dissolved salts and electrolytes out of the solution and to vaporise the liquid - water - into the atmosphere while the vehicle is driving. The filter with the salts and electrolytes has to be changed roughly every 10,000 kilometres and can then be disposed of in an ecologically responsible manner. Because the bi-ION tanks empty while driving, they can be conveniently refilled. Instead of the laborious and time-consuming charging procedure for electric cars, it requires only a refuelling process similar to the regular one for vehicles with combustion engines. 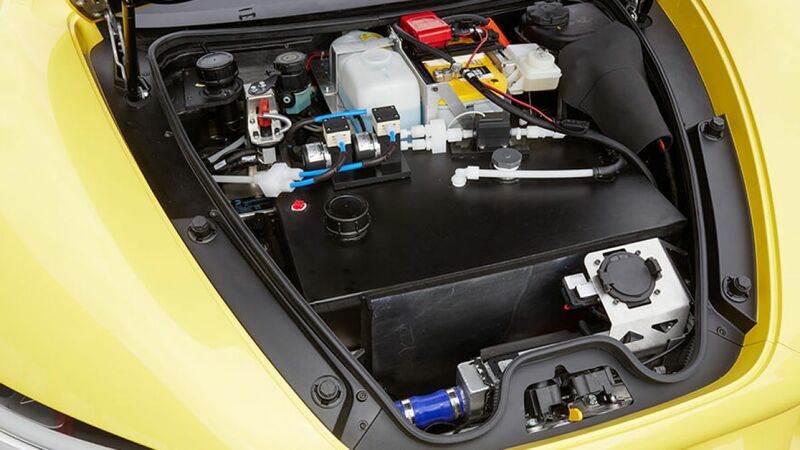 The nanoFlowcell energy storage medium in the QUANT FE is an "open" fuel cell - which distinguishes the nanoFlowcell from conventional redox fuel cells. Isn&apos;t the production and distribution of bi-ION complicated? The production of bi-ION can be industrialised and is based on complex electrochemical processes. It can be done in an environmentally responsible manner, e.g. through use of renewable energies. Because bi-ION production can be de-centralised, it is suited to facilities able to ensure production using renewable energies. Although in itself "non-political", bi-ION contributes to a reduction in dependence on fossil fuels and their suppliers. All waste products generated in the production of bi-ION are neutralised in an environmentally responsible manner during the production process. It generates no waste products that are in any way harmful to health or the environment. bi-ION is neither toxic nor harmful to the environment and neither flammable nor explosive. There are therefore no hazardous goods requirements for the transport and distribution of bi-ION. On this basis, a distribution network for bi-ION would be fast and uncomplicated to establish. It could also be integrated into the existing fuel-station network. Current pump systems could also be used for bi-ION with some modifications.